Once again I’ll be headed back to Australia to spend the Christmas holidays with my family! 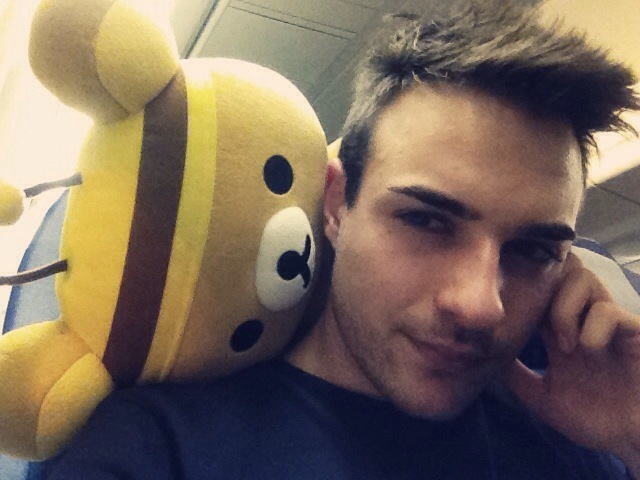 Currently sitting at the terminal in Hong Kong waiting for a connecting flight with a trusted rilakuma at my side. 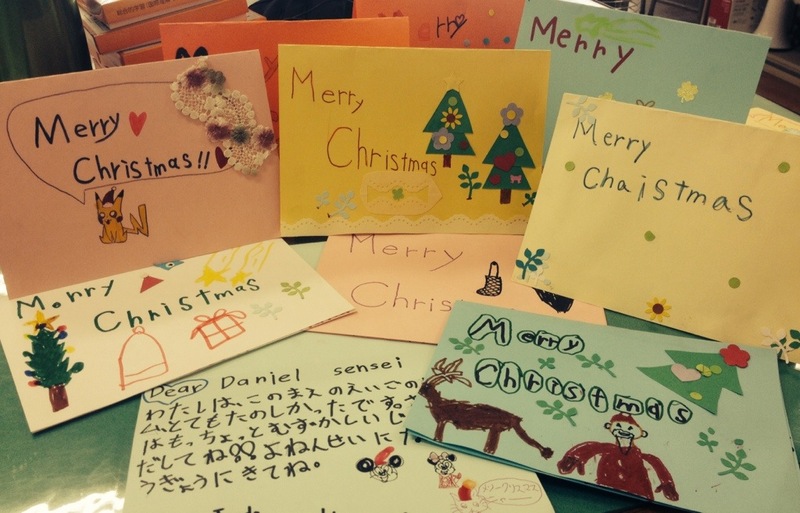 To all my readers I bid you a Merry Christmas and happy new year from nihonomnom. Today after teaching a Christmas lesson to one of my favorite 3rd year classes at my elementary, the kids took me by surprise! Soon as i finished the farewell, they all ran up to me at once pushing dozens of Christmas cards they had written for me into my hands! I thought this one was cute. 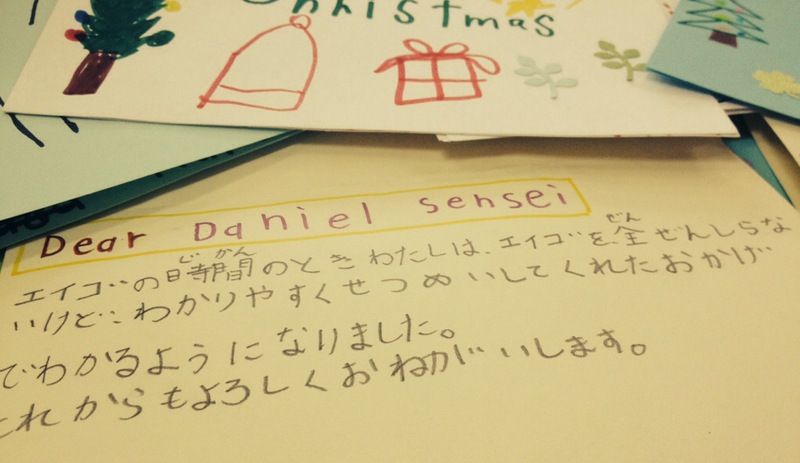 My Japanese isn’t amazing but it basically says. English classes are fun, even though I don’t understand any English at all! I now understand because the explanation was clear. Please continue to teach me in the future. 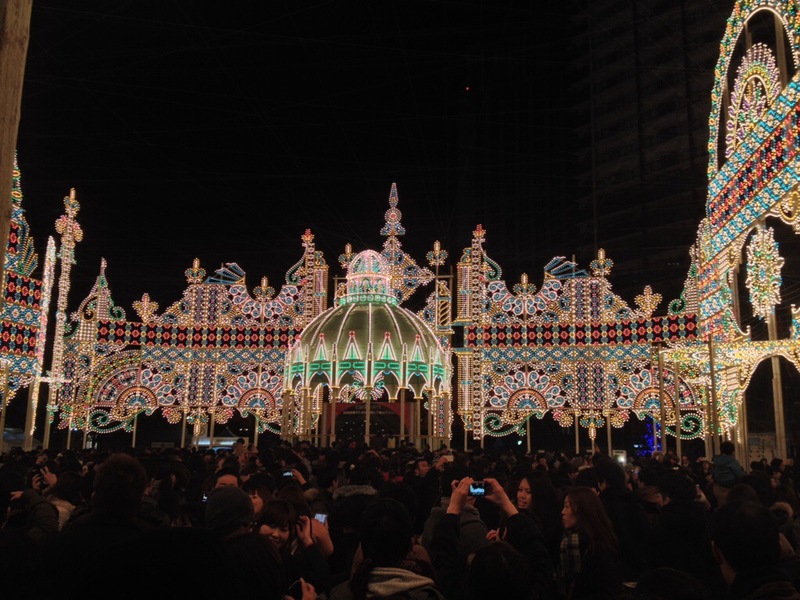 Kobe Luminarie 神戸ルミナリエ has been a grand event held in Sannomiya the central district of Kobe, for around 2 weeks every December since 1995. 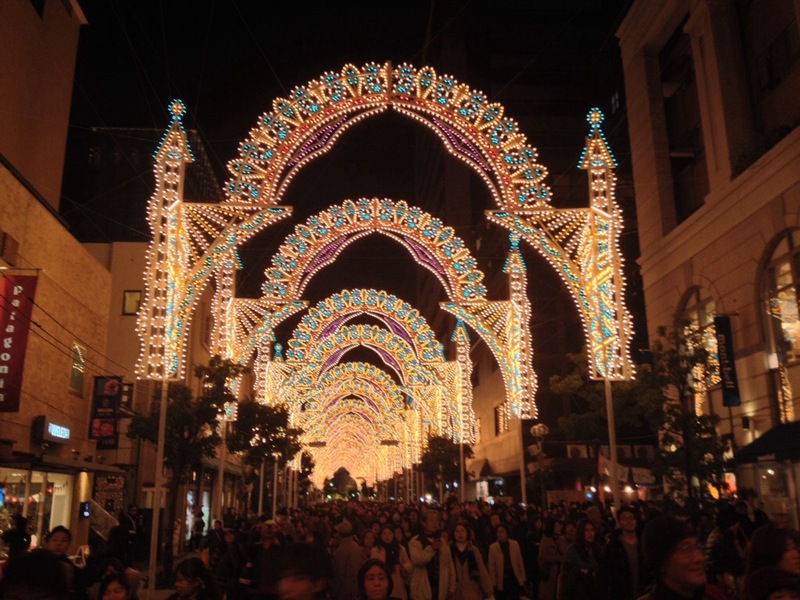 The lights were donated by the Italian government to commemorate the Great Hanshin Earthquake which had devastated much of Kobe that year, resulting in the deaths of around 4600 residents. 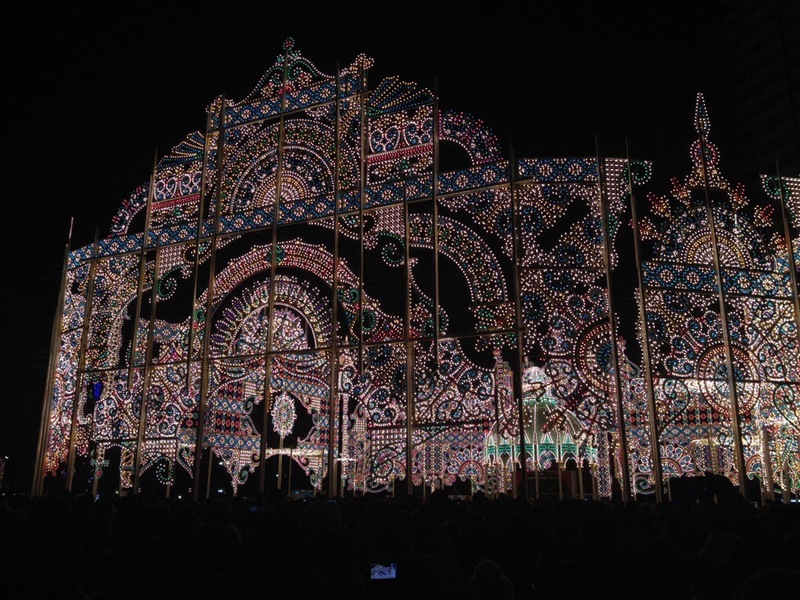 The display includes around 200,000 hand painted lights which have been lit every year as a tourist attraction to draw people back to Kobe after the disaster. In addition the event acts as a fundraiser to help cover the 100 billion dollars of damages that were caused by the Earthquake. Unfortunately I missed out of seeing the lights last year,as the event conflicted with my return to Australia over the Christmas break. 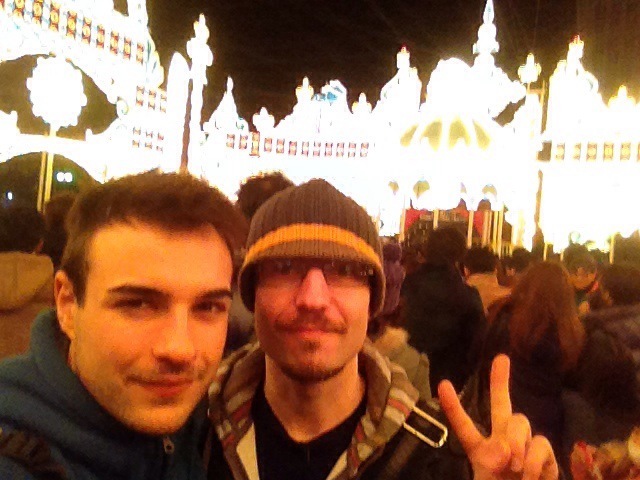 This year however I was lucky enough to check it out with my good mate Pete! Protip: If you are attending this event, don’t be a stooge and line up with the masses! Especially on the weekends people will wait for hours and hours just to walk down the shopping street! The thing about Japan is the average person here doesn’t really break the rules, so there is little to no security at things like this. If you simply just walk along parallel to the enormous lines of people, there is really nothing stoping the clever of us from just slipping into the river of people at the entrance of the event.